BRUSSELS (AP) — As if Brexit hadn't spooked Britain and the European Union enough over the past three years, the two sides agreed early Thursday to extend the deadline to Halloween. BRUSSELS (AP) — European Union leaders worried about China's growing power are devising plans to counter the ambitions of a country they describe as a "systemic rival." What’s next after UK seeks 3-month delay to Brexit? 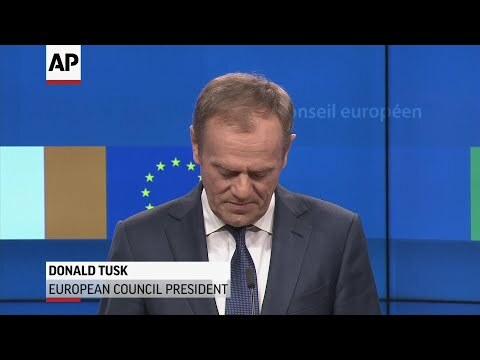 BRUSSELS (AP) — European Council President Donald Tusk took a swipe Wednesday at some Brexit-backers in Britain, wondering aloud what "special place in hell" might be reserved for those who had no idea how to deliver the country's exit from the European Union. European Union official Donald Tusk says the bloc won't renegotiate the Brexit deal with the U.K. government as he called a summit Thursday to examine ways to help Britain ratify the deal. Tusk, the president of the European Council, tweeted that "we will not renegotiate the deal, including the backstop, but we are ready to discuss how to facilitate U.K. ratification." VATICAN CITY (AP) — The Vatican has made more progress in its path to greater financial transparency by securing approval to join the European banking system that harmonizes electronic payments across the continent. With the endorsement of the European Council, the Vatican City State and Holy See are now included in the Single Euro Payments Area, known as SEPA. That allows the Vatican bank to have its own IBAN code — the unique numerical identifier that facilitates wire transfers between banks. LONDON (AP) — Britain's besieged Prime Minister Theresa May warned Sunday that a leadership change wouldn't make Brexit negotiations easier, as opponents in her Conservative Party threaten to unseat her and the former Brexit secretary suggested she failed to stand up to bullying from European Union officials. WARSAW, Poland (AP) — European Council head Donald Tusk, a former Polish prime minister, on Saturday denounced the euroskeptic populists governing Poland as "contemporary Bolsheviks" who threaten the nation's independence, but can be defeated. Tusk, seen as a likely contender in Poland's 2020 presidential election, spoke in the city of Lodz on the eve of the 100th anniversary of the country regaining its statehood at the end of World War I after 123 years of foreign rule. BUDAPEST, Hungary (AP) — A senior Hungarian official says a European Union procedure launched against the country for allegedly undermining EU values and rule of law sharpens divisions between newer and older members of the bloc. Gergely Gulyas, Prime Minister Viktor Orban's chief of staff, said Friday that sanctions against Hungary under the procedure known as Article 7 would be "impossible." LONDON (AP) — British Prime Minister Theresa May and European Council President Donald Tusk spoke by phone Wednesday amid signs of movement in deadlocked Brexit talks. Tusk tweeted that the pair spoke "to take stock of progress in #brexit talks and discuss way ahead." Tusk has said he is willing to call a special EU summit if there are new proposals from Britain to unblock talks. WARSAW, Poland (AP) — Donald Tusk, the head of the European Council, strongly defended his actions as Poland's former prime minister during questioning Monday into a pyramid scheme that cheated thousands of Poles out of their savings. In an emotional moment during the seven-hour hearing, which was televised live across Poland, Tusk told the ruling conservative party that it was using his questioning by a parliamentary committee for political purposes. BRUSSELS (AP) — Europe and Asia should use their combined economic clout "to tackle global challenges such as trade tensions that put millions of jobs at risk" and the threat of climate change, a top European official said Thursday. European Council President Donald Tusk says new thinking is required to end the Brexit standoff and is likening the Irish border problem to the mythical Gordian Knot that cannot be untied. Tusk said Tuesday that "we need maybe a new method of thinking." A top European Union official says key parts of Britain's offer to conclude Brexit talks fall short of expectations and need to be improved, just six months before the country leaves the bloc. European Council President Donald Tusk said "the U.K.'s proposals will need to be reworked and further negotiated." He noted issues surrounding the Irish border and future economic cooperation. BEIJING (AP) — A senior European official on Monday urged U.S. President Donald Trump, Russian President Vladimir Putin and China to work with Europe to avoid trade wars and prevent conflict and chaos. Speaking before Trump and Putin were due to meet in Helsinki, European Council President Donald Tusk appealed for leaders to avoid wrecking a political and economic order that nurtured a peaceful Europe and developing China. European Council President Donald Tusk is ruling out any European Union role in the dispute between Spain and Catalonia as Madrid weighs whether to reclaim some powers from the regional government amid an independence dispute. Tusk told reporters Thursday on the sidelines of an EU summit that "there is no room, no space for any kind of mediation, or international initiatives or action."